and catching a glimpse of the chequered flag. 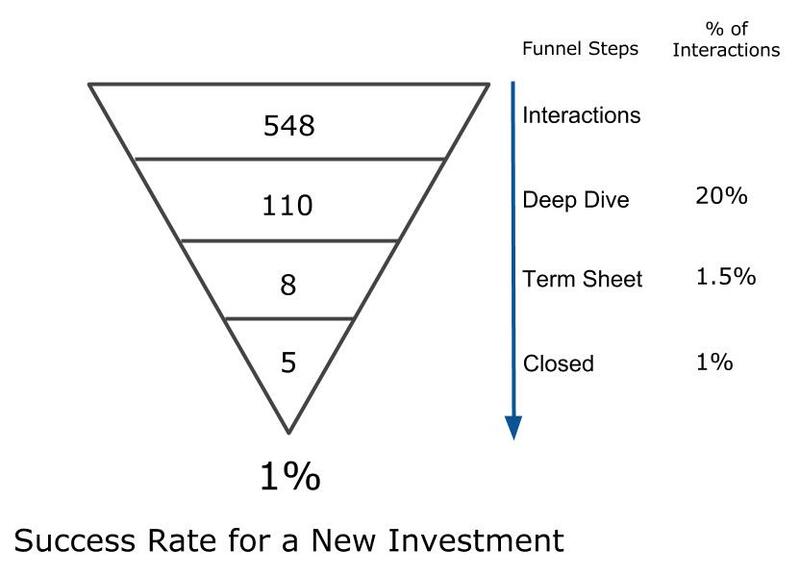 Most, if not all, VCs optimize their deal funnel for (their own) efficiency. The objective is to quickly identify the “NOs”, track the progress of the “MAYBEs”, and focus on the “LIKELYs” to decide whether to issue a term sheet or not. How do our numbers break down? As we touched on in the previous post, about a third of the 1600 opportunities we received – 548 in total – got to engage with the Beacon team through a meeting or a call. Subsequently, a fifth of those moved into Deep Dive, during which we spend time to get to know the team and understand the opportunity in more detail. We issue term sheets for about 1% of the opportunities that we interact with, and we intend to close all of these. If 1% seems tiny (all this work for 1%! ), bear in mind that we also have an existing portfolio of 29 (soon to be 30) investments and in 2015 our existing investments raised 8 follow on rounds. Our deal making capacity – based on the last 3 years – is on average one deal a month but as our existing portfolio companies grow and raise follow on rounds (they have raised over $100 million in total in 3 years) it can somewhat affect our capacity for new deals. The silver lining – if you are a portfolio company – is that we help you! Our objective remains the same- to discover which MAYBEs have to (regrettably) be NOs and which could receive funding- but at this point we like you and the opportunity enough to start devoting resources to it. The odds are still stacked against doing the deal; and this stage has the highest rejection rate (less than 1 in 10 will make it to the next stage). We perform a desktop review of the market, your product, and the business model. This covers the usual elements that one expects (i.e. market size, competitive landscape, what enterprise budget do you target, how significant is the “pain point” being addressed, the team’s synthesis, traction over time, etc.). Typically, we would have seen at least half a dozen similar opportunities previously and will be familiar with where the challenges lie. We call on our resources – the Venture Partners, other entrepreneurs and industry contacts – until we feel we have an informed view on the opportunity. We will also consider further the balance of the founding team, their current skills and ambitions, and their past achievements both in and out of business. We will take a first look at the numbers to ensure that these fit with the market opportunity and business model presented and that adequate funds are being raised at this stage of business development. If we are not convinced after a bit of digging, we always make it a point to give the entrepreneur speedy and honest feedback. If we do believe in the opportunity but it is a little early for us, we suggest that we re-engage further down the line. We only convey that if we like the opportunity, not as a “get out of jail” card for us. What do we look for? For well prepared entrepreneurs this is the easiest of phases and they usually whizz through. Be responsive to our requests, share openly, and try to figure out whether you would like working with us. If the Deep Dive has not turned our MAYBE into a NO, we issue a term sheet. We now consider (subject to due diligence) that you are building a substantial business; and that we would like to work with you. Yes we did say “subject to due diligence”; Deep Dive is the key commercial diligence on you and the opportunity, however, we still need to confirm what we discussed. Here we will principally check facts, corroborate key statements and beliefs and fulfill any legal or regulatory requirements. It may be that we have agreed to take references from customers and business only after the term sheet is signed in which case this will be done then. In any case we will specify exactly in the term sheet what we will do prior to completion of funding. We always discuss the terms verbally with you before we send the term sheet across. As lead investors, we define further confirmatory due diligence and we try to coordinate this with the other investors too. This sounds onerous but most entrepreneurs sail through and they see it as a good training exercise for their next financing rounds (which may get more complicated if things go well!). We also discuss whether or not we would take a board seat post-investment; usually we do, and we are particularly active in helping the business over the funding period (typically 18 months). This could potentially be a messy phase if there are multiple parties offering a term sheet or participating in the round. Having a lead investor in place should help ease the multi-party negotiations. NB: We will write a separate blog on term sheets and how to deconstruct and compare term sheets clause by clause. If you have any specific questions do let us know. What do we look for? The savviest entrepreneurs (and VCs). Stay cool, communicate a lot and avoid playing games. This can be a test of our early relationship and how easily issues will be resolved post investment. At this stage, it seems that we have (almost) made it. What remains is just the final stretch to the chequered flag! This stage deserves a post by itself but suffice to say with two (or more!) set of lawyers now involved in the process and often two or more other investors in the round, things can get complicated (obtaining signatures, warrant letters, KYC processes, finalising investor consent matters etc..). The important thing is that both we, usually as the lead investor in the round, and your team are now keen to conclude matters. Both parties have invested time, emotion, and often money in coming this far and want the investment to take place. Warning: We never issue term sheets “speculatively”. When we issue a term sheet we want to close the deal. Last year we did not close three deals we intended to. The reasons were varied: negotiations breaking down with the team possibly due to the lead investor (not Beacon) issuing a term sheet too early in the process; a company not passing product DD (lack of sufficient data to back up a particularly important statement about the product performance); and, one of the founders facing a particularly strenuous personal situation that changed the risk profile of the opportunity. Sometimes life gets in the way but if everything goes to plan, we close all the term sheets we issue. What do we look for in founders during the investment process? Entrepreneurs (and also VCs for that matter) that don’t flinch under fire; stay cool and work towards the closing stages. If an unforeseen event arises, deal with it immediately and openly. Investors at this stage are as keen as you are to close and will do everything to help (NB: when the particular circumstances allow us, we will share a remarkable story of a young company which we almost funded and why we did not). Finally, after the papers are inked (more likely DocuSigned these days), we enjoy a customary “closing drink” and try not to forget that this is the beginning (not the end!) of the hard work. Just 1% of the opportunities that broadly fit our investment strategy (of the 548 opportunities out of a universe of 1600) in 2015 made it to our portfolio. 1% is pretty striking, “needle in a haystack” might you say. Maybe, but if this needle grows to become the next Azimo, MoveGuides or Ometria, it is well worth the effort. The opportunities knocking our door are overwhelming with great talent, ambitions and dreams. Yet, we are standing on the edge to take decisions whether these startups will make it or break it in the future. What’s the best thing you can do when you approach us? Make a strong case, give us both vision and facts. Prepare a solid deck that shows the tech (share a demo), the team, traction (data, not words) and the timing (why is now the right time to go after this, what “shifted” in the market that created an opportunity). Even when they do not realise it, entrepreneurs identify an “arbitrage” opportunity in the market and go for it. Tell us what you think that is. Think about the type of investor you would like to work with. There is plenty of “easy” money available; but spending a little more time with the right investor could benefit the business long term. Be transparent in your dealings with us. Keep the lines of communication open – especially when the communication is getting tricky. Keep in mind that securing investment is only the beginning. The hard work for both parties begins post-close. It is always harder when you have money in the bank to spend. For both parties, it can sometimes feel like an eternity to get to the finish line (usually spanning 4 to 8 weeks), but the point here is to make the process as quick and frictionless as possible. Having worked with entrepreneurs at both ends of the spectrum, we are aware there is no magic formula, but being thoroughly prepared during the deep dive, to clear communication during the closing process, can make a huge difference. Please let us know if you have any questions or any comments you would like to share. Next up, we plan to break down some more interesting numbers that we see in our deal flow at both ends of the funnel. See you soon with the next post!